A student of such acclaimed artists as Marc di Suvero and John Henry, John Clement’s geometric work certainly follows in a similar tradition of large-scale Constructivist-inspired sculpture, and yet breaks the boundaries of the genre by constantly playing with the ideas of form and space in curvi-linear compositions. 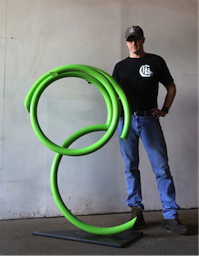 His work juxtaposes a variety of playful steel coils and arcs that, layered on top of one another, take on a life of their own. While today Clement focuses primarily on large-scale outdoor work, reminiscent of both di Suvero and Henry’s association with public sculpture, his smaller works are evocative of a parallel but unique joyfulness. Viewers cannot help but think that the works are, on their own volition, about to swivel about on their bases and spin about in space. Clement’s dynamic and dramatic union of form, line and negative space emphasizes the impression of implied movement. After receiving a BA from the University of Pennsylvania in 1992, Clement studied briefly at New York’s School of Visual Arts before moving on to work with di Suvero and Henry in the 1990s. In addition to numerous gallery exhibitions, Clement has also completed many important public commissions and installations across the United States and abroad. He currently lives and works in Brooklyn, NY. Ta Da, City of Long Beach, Long Beach, CA, November 2010. Duke, Miami Shores Village Hall, Miami, FL.